Thanks Liz Wilson for the photo! It's been a bit since you've seen some news here. Rest assured, that's NOT because we've been inactive. Quite the contrary, we've been too busy riding to keep the virtual end of things up to date. The picture above is from the 6 Hours of Brady's Run race on May 10th. We're all smiling because this was before it went all down. Yes, we had a unicycle class with 8 total entries. It was definitely a FANTASTIC experience. Not only because we had a great group of riders- including Liz and James from out of state, but because the organizers do an amazing job of putting on an event that welcomes all levels of riders. 6 Hours is a long time to ride a unicycle, but it's much easier when you're sharing the experience with other cycling brothers and sisters- even if they have 2x as many wheels. A 5 minute video isn't very good at capturing the whole experience. As with Brady's Run, we'll be back next year. We plan on heading to The Wheel Mill this Friday for Family and Unicycle Night. For the Summer, we're splitting out time between there and the Friday Night Rides here in Butler. May is almost over. 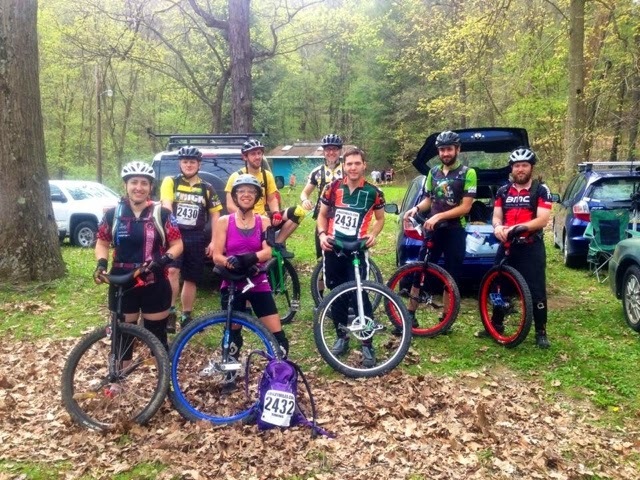 June's got the Fat Tire Challenge (the FIRST Western PA race to have a uni class! ), NAUCC and a few other surprises. July ends with Unicon and August starts with it. We'll be riding. You should too. If you can't ride an uni yet but would love to learn, you can try to catch up with us over the next few months, but a better option might be to check out Unicycling Mondays at THICK Bikes in Pittsburgh. We'll probably be there for a few too.